Leaf: largest generally oblanceolate, teeth coarse, bristle-tipped. Flower: calyx (except bristles) 1/2--3/4 corolla tube, lobes bristle-tipped; corolla strongly bilateral, 11--21 mm, white to deep rose-purple, upper lip 5--11 mm, 3/4 to > tube, < longer stamens, lobe bases with bright maroon arches and white blotch, rarely suffused with yellow, lower lip 4--7 mm, lobe tips truncate, 3-toothed, or notched, generally with inward-directed projections in sinuses on either side of middle lobe of upper lip. 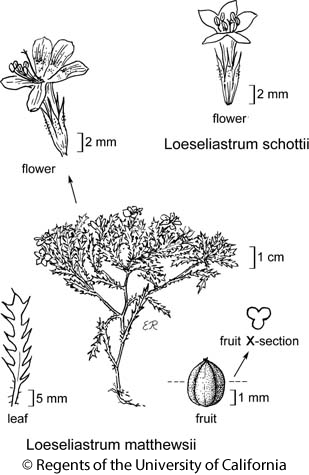 Citation for this treatment: Dieter H. Wilken & Steven L. Timbrook 2012, Loeseliastrum matthewsii, in Jepson Flora Project (eds.) Jepson eFlora, http://ucjeps.berkeley.edu/eflora/eflora_display.php?tid=31360, accessed on April 19, 2019.
n TR, n PR, SNE, DMoj, w DSon; Markers link to CCH specimen records. Yellow markers indicate records that may provide evidence for eFlora range revision or may have georeferencing or identification issues. Purple markers indicate specimens collected from a garden, greenhouse, or other non-wild location.